Tornadoes, USA – The National Weather Service (NWS) in Hastings has confirmed two more tornadoes in Nebraska that occurred on Christmas Day. This is in addition to the tornadoes near Funk and Alton, Kansas. On 29 December an EF-1 tornado touched down northeast of Atlanta, Georgia. Bogoslof (United States, Aleutian Islands): Another (the 6th) large explosion seems to be occurring this morning at the volcano. The Alaska Volcano Observatory reported detecting a strong seismic signal (captured on neighboring islands) and a swarm of lightnings typical for large eruption ash plumes near the volcano and extending north (as the ash plume drifts in this direction). Weather cloud tops at 30,000 ft prevent visual and other satellite conformation (so far) of the likely ash plume which could have reached similar altitudes. The eruption started presumably at 22:30 local time (07:30 UTC Dec 29) and is continuing at the time of writing. Bagana | Bougainville (Papua New Guinea) : Based on analyses of satellite imagery and model data, the Darwin VAAC reported that during 22 and 25-27 December ash plumes from Bagana rose to altitudes of 2.1-2.4 km (7,000-8,000 ft) a.s.l. and drifted 45-85 km S, SW, and WSW. Copahue | Central Chile-Argentina border : Based on satellite and webcam images, the Buenos Aires VAAC reported that during 21-23 December gas-and-ash plumes from Copahue rose to altitudes of 3.6-3.9 km (12,000-13,000 ft) a.s.l. and drifted SE and ESE. Dukono | Halmahera (Indonesia) : Based on analyses of satellite imagery and model data, the Darwin VAAC reported that during 21-26 December ash plumes from Dukono rose to altitudes of 2.1-2.4 km (7,000-8,000 ft) a.s.l. and drifted as far as 185 km NE, ENE, E, and SE. Fuego | Guatemala : In a special bulletin from 21 December, INSIVUMEH reported the beginning of the 16th Strombolian episode in 2016 at Fuego. Ash plumes rose 1.5 km above the crater and drifted 18 km S, SW, W, and NW, and ashfall was reported in nearby areas including Morelia (9 km SW), Santa Sofía (12 km SW), Panimaché I and II (8 km SW), and Sangre de Cristo (8 km WSW). Lava fountains rose 200-300 m above the crater and fed three lava flows: the first traveled 2.5 km W down the Santa Teresa drainage, the second traveled 2 km SW down the Taniluyá Canyon, and the last traveled 1.8 km SE down the Las Lajas drainage. Shock waves from explosions rattled structures within a 12-km radius. During 24-27 December weak explosions generated ash plumes that rose 450-750 m and drifted 5-10 km W and SW.
6.2 Earthquake hits the Sambawa region, Indonesia. Turkey – Heavy snowfall and rains along with cold weather across Turkey paralyzed ordinary life for people while precipitating deadly floods in the southern part of the country and suspending education at many schools in central and northern provinces due to snow. Two people were killed in the southern province of Mersin on Dec. 29 due to a flood that was caused by heavy rains in the region. With many trapped inside their vehicles, the municipality issued a warning statement calling on people to stay at home throughout the day if possible. While the rainfall affected life negatively in Mersin, heavy snowfall also halted life in central and northern Anatolia. Authorities in 21 provinces, mostly in central Turkey but also in northern Anatolia, said schools had been closed for the day due to heavy snow and icy conditions that were expected to follow. These ancients were around when ancient Sumerians scratched their cuneiform on clay tablets, and they were standing when Alexander the Great swept across Asia. They bore witness to both the rise and fall of the Roman Empire, survived Columbus’ colonization of the New World, and saw the birth and expansion of the United States. But now, because of climate change, the oldest trees on the planet may be facing their eventual extinction, a new study suggests. Ancient bristlecone pines (Pinus longaeva), which thrive in the upper reaches of the White Mountains in California, could be supplanted by younger trees from an upstart species as temperatures warm and baby trees begin to grow higher on the mountain. The world’s oldest genetically unique trees reside just below the tree line, where the scant rainfall, frigid air, and rocky limestone soil eliminates all but the hardiest of species. From about 9,500 to 11,500 feet (2,900 to 3,500 meters), bristlecone pines dominate the landscape. In the few patches with sandier, more granite-like soils, native limber pine trees (Pinus flexilis) cluster, according to the statement. 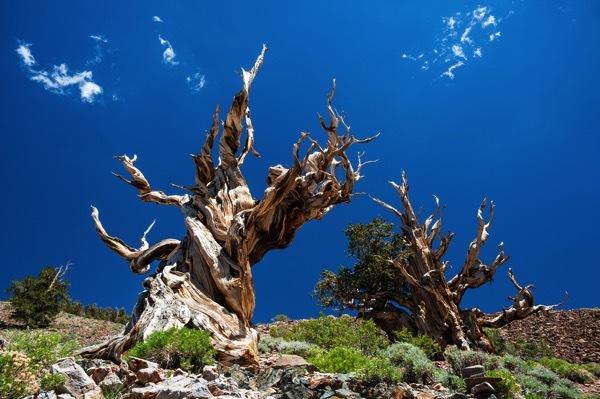 The oldest individual tree in the world is a 5,062-year-old P. longaeva in the White Mountains, and the second-oldest tree, dubbed Methuselah, is also a Great Basin bristlecone pine living nearby. Above the tree line, temperatures are too cold to support trees, but global warming has shifted the tree line higher up the mountain. Because temperature typically governs where trees live, that would ordinarily mean that trees such as the bristlecone pine would simply start growing at higher altitudes. Most of the baby trees colonizing the higher altitudes above the tree line appear to be limber pines, the researchers found. It turns out that limber pines got an assist from the Clark’s nutcracker, a local bird that munches on and disperses the trees’ seeds. This process speeds up how quickly limber pines can colonize new locations, the study found. The week’s hottest temperature was 126.0 degrees Fahrenheit (52.2 degrees Celsius) in Death Valley, Californiaa. The week’s coldest temperature was minus 115.0 degrees Fahrenheit (minus 81.6 degrees Celsius) at Russia’s Vostok Base, Antarctica. A month without precipitation in southern Switzerland has led to several wildfires breaking out on the south side of the Alps. Three military Super Puma helicopters are assisting the firefighters on the ground. Bezymianny | Central Kamchatka (Russia) : KVERT reported strong gas-and-steam emissions at Bezymianny during 16-23 December; a gas-and-steam plume drifted about 60 km SW on 18 December. A daily thermal anomaly was detected over the volcano. The Aviation Colour Code remained at Orange. Bogoslof | Fox Islands (USA) : AVO reported that the explosive eruption at Bogoslof, which was reported by several pilots around 1530 on 20 December and produced an ash plume that rose to 10.3 km (34,000 ft) a.s.l., lasted about 30 minutes. The ash plume detached and dispersed S. AVO had raised the Aviation Colour Code (ACC) to Red and the Volcano Alert Level (VAL) to Warning, but since no further activity was detected or observed the ACC was lowered to Orange and the VAL was lowered to Watch. On 21 December periods of discrete earthquakes and continuous seismic tremor were recorded by instruments on nearby volcanoes. At 1610 an explosive eruption detected in satellite data and by seismic instruments on nearby islands again lasted about 30 minutes. An ash plume rose to an altitude of 10.7 km (35,000 ft) a.s.l. and drifted N. The ACC and VAL were raised to Red and Warning, respectively. Seismicity declined rapidly afterward and remained low; the ACC was lowered to Orange and the VAL was lowered to Watch. Strong continuous seismic activity started abruptly at about 1340 on 22 December. Ebeko | Paramushir Island (Russia) : KVERT reported that, according to observers in Severo-Kurilsk (Paramushir Island) about 7 km E, gas-and-steam plumes containing a small amount of ash rose from Ebeko to an altitude of 1.5 km (4,900 ft) a.s.l. and drifted 8 km N and NE on 17 and 20 December. Minor amounts of ash fell in Severo-Kurilsk during 18-22 December. Ash plumes rose as high as 2 km (6,600 ft) a.s.l. on 27 December. The Aviation Colour Code was raised to Orange (the second highest level on a four-colour scale). Klyuchevskoy | Central Kamchatka (Russia) : On 26 December KVERT reported that a weak thermal anomaly over Klyuchevskoy had been detected after the April-November eruption. Gas-and-steam plumes sometimes contained small amounts of ash. The Aviation Colour Code was raised to Yellow (the second lowest on a four-colour scale). Langila | New Britain (Papua New Guinea) : Based on analyses of satellite imagery and wind data, the Darwin VAAC reported that during 21-24 December ash plumes from Langila rose to an altitude of 2.4 km (8,000 ft) a.s.l. and drifted N, NW, S, and SE. 5.1 Earthquake hits offshore Chiapas, Mexico. 5.1 Earthquake hits the Cook Strait, New Zealand. Migrating birds are responding to the effects of climate change by arriving at their breeding grounds earlier as global temperatures rise, research has found. The University of Edinburgh study, which looked at hundreds of species across five continents, found that birds are reaching their summer breeding grounds on average about one day earlier per degree of increasing global temperature. The main reason birds take flight is changing seasonal temperatures and food availability. The time they reach their summer breeding grounds is significant, because arriving at the wrong time, even by a few days, may cause them to miss out on vital resources such as food and nesting places. This in turn affects the timing of offspring hatching and their chances of survival. The research included species that travel huge distances, such as the swallow and pied flycatcher, as well as those with shorter migrations, such as the lapwing and pied wagtail. British swallows fly through western France, across the Pyrenees, down eastern Spain into Morocco, and across the Sahara, to spend their winter in South Africa from around September or October. Migrating swallows can cover 200 miles a day at speeds of 17-22 miles per hour, with a maximum flight speed of 35mph. The study, published in the Journal of Animal Ecology and supported by the Natural Environment Research Council, will help scientists better predict how different species will respond to environmental changes. Long-distance migrants, which are shown to be less responsive to rising temperatures, may suffer most as other birds gain advantage by arriving at breeding grounds ahead of them. Bolivia – Parts of Bolivia go on ‘orange alert’ after massive flooding kills eight people following heavy rains. At least eight people are dead after torrential rains swept through the country causing massive flooding. Bolivia’s national weather service has issued an orange alert for five areas in the west of the country. The flooding stranded drivers and pedestrians alike in Cochabamba. The heavy rains come in the wake of Bolivia’s worst drought in 25 years. Philippines – Floods triggered by heavy rains have inundated cornfields, roads and a major bridge, which affected traffic in Tuguegarao City, Cagayan. Rains have been pounding this city since Tuesday (Dec. 27), prompting operators of the Magat Dam to release water when its reservoir level reached 192.50 meters above sea level. A large vegetation fire near Grabouw in the Western Cape appears to be spreading. Firefighters are battling the blaze on the mountain slopes. 5.8 Earthquake hits Nevada, USA. 5.3 Earthquake hits Nevada, USA. In the western Pacific: Tropical Depression 30w (Nock-Ten), located approximately Located approximately 407 nm east-northeast of Ho Chi Minh City, Vietnam, and it is forecast to move west-southwestward at 15 knots.